University of Limerick today (Wednesday, September 26, 2018 at 4pm) conferred artist Brian O’Doherty with an honorary doctorate in recognition of his contribution to national and international art. An artist, novelist, critic and dramatist of international acclaim, Brian O’Doherty left Ireland in the 1950s after completing his medical degree. A native of County Roscommon, he made his home in Manhattan and went on to become a leading figure in the visual and literary arts. He was nominated for a Booker prize for his novel The Deposition of Father McCreevy and his paintings have been acknowledged in five retrospective exhibitions in Washington D.C., New York, Ohio, Derry and Dublin. In 1972, Brian O’Doherty changed his name to Patrick Ireland, in response to the Bloody Sunday killing of thirteen unarmed citizens of Derry. Thirty-six years later, following the establishment of power sharing in Northern Ireland, a choreographed ‘funeral’ was held for Patrick Ireland at the Irish Museum of Modern Art. UL’s Dean of Arts, Humanities and Social Sciences, Professor Helen Kelly Holmes, described the conferral as a great honour for University of Limerick. “The Honorary Doctorate Conferring Ceremony gives us an opportunity to express our values as an institution as well as to bask in the reflected glory of a stellar individual. In this case, it’s hard to imagine a more luminous candidate that Brian O’Doherty. His work is the embodiment of our institutional values - a nexus of scholarship, creativity, conscience and disruption at the intersection of many disciplines,” she said. “One of Brian’s most distinguishing achievements as an artist has been to break out of his milieu and to wield his art in a meaningful political context. University of Limerick has always had a keen commitment to the world outside the campus, to the Limerick city community and county. We take seriously the political role of the university to inform enlightened policy, to rebalance educational inequality, to defend human rights and to stand up for progressive democracy and relentless inquiry in the face of autocracy and anti-intellectualism,” she continued. “Brian O’Doherty’s fearless exploration of his subject matter over many years provides us with a shot of courage to keep challenging orthodoxy while honouring what the past has taught us,” Professor Kelly Holmes added. University of Limerick president, Dr Des Fitzgerald, conferred upon Brian O’Doherty, the honorary degree of Doctor of Letters at the ceremony held in UL’s historic Plassey House this afternoon. 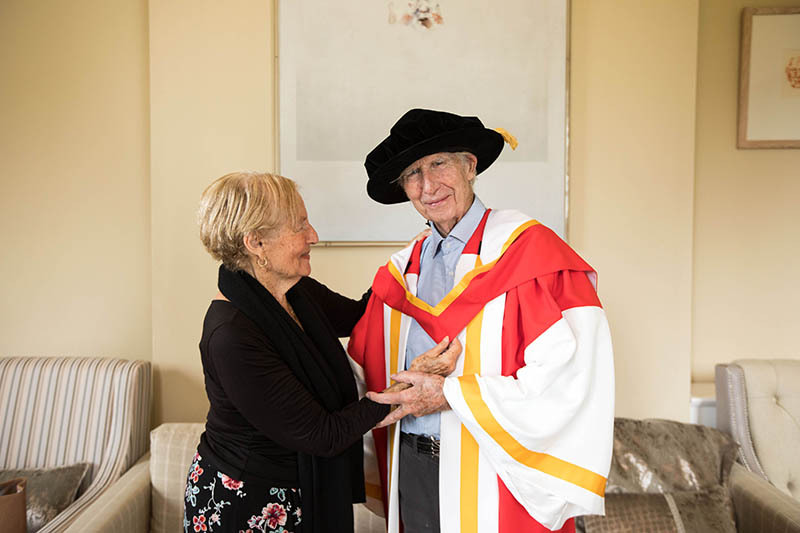 Earlier in 2018, UL conferred honorary degrees on public health campaigner Vicky Phelan and internationally renowned engineer Professor Robert Langer.